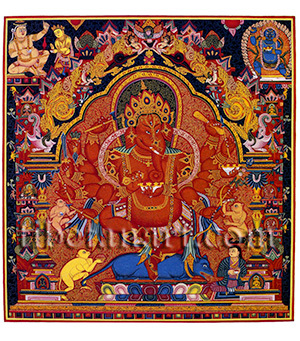 This painting of Maharakta Ganapati is a copy of a famous early fifteenth century Newar thangka that was first commissioned for Ngor Sakya Monastery in Southern Tibet. Maharakta or 'Great-red' Ganapati has twelve arms and dances in bow-and-arrow posture above his large blue rat vehicle. With his six right hands he holds an axe, an arrow, a club, a sword, a dart, and a vajra; and with his six left hands he holds a wooden pestle, a bow, a khatvanga-trident, a fresh skull, a spear, and a skull-cup full of blood. Around him are three monkeys that offer a white radish, a bowl of laddu sweets and a precious gem; and the Sakya nobleman who probably commissioned this painting. Ganapati is enshrined by an elaborate torana and he abides within a cave of five-coloured beryl, with many small deities, mythical creatures, auspicious symbols and various trees appearing amidst its crystalline structure. In the upper left corner is the Indian Mahasiddha Virupa, and in the upper right corner is the wrathful 'spirit-subduing' four-armed form of Bhutadamara Vajrapani.